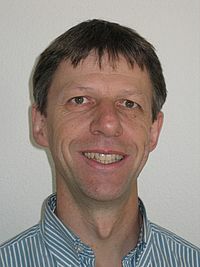 Prof. Christian Grimm is principal investigator and group leader of the lab of Retinal Cell Biology at the University of Zurich, Switzerland. Our research aims at the understanding of the pathophysiology of retinal degenerations. This provides the basis for the interference with death pathways and/or the support of endogenous survival mechanisms to protect visual cells and to prolong the period of useful vision for patients. Analysis of the retinal gene expression profile after hypoxic preconditioning identifies candidate genes for neuroprotection. Differential role of Jak-STAT signaling in retinal degenerations. Constitutive overexpression of human erythropoietin protects the mouse retina against induced but not inherited retinal degeneration. HIF-1 – induced erythropoietin in the hypoxic retina protects against light-induced retinal degeneration. New views onRPE65 deficiency: The rod system is the source of vision in a mouse model of Lebers congenital amaurosis. AP–1 mediated retinal photoreceptor apoptosis is independent of the JNK-pathway. The Rpe65 Leu450Met mutation increases retinal resistance against light–induced degeneration by slowing rhodopsin regeneration. Gene expression in the mouse retina: The effect of damaging light. Protection of Rpe65–deficient mice identifies rhodopsin as mediator of light–induced retinal degeneration. c–Fos controls the ‘private pathway’ of light–induced apoptosis of retinal photoreceptors.